Date of 2002 London-Brighton Commercial Run ? : On May 5th. Vince Gowler has a differential centre section with markings ATA7034PBM BRITMO. Any ideas what vehicle it is from? Request from Svend Larsen of NORWAY for info on Norton 7. Contacts with Josip Jurisic of Croatia re local vintage cars. Request from Jurgens Welken of SOUTH AFRICA for more info on the Rainier Car Collection. Request from German car website babez.de for inclusion of SVVS car info on their site. Request from Mark Bowell for info on selling the car in Ireland. Request from NEW ZEALAND in valuing car purchased by New Zealand Government for the 1953 Royal Tour and used by Queen. UK Prices for similar car suggest £4-6K, this poss. more. Iris Mullins and her father in AUSTRALIA are restoring an old Darracq in the family since 1910 and wanted help on the hood and stays. Info by SVVS's David Locket and Nigel Macdonald. Shaun Robinson of Queensland Australia has a 1927 HK Series and wanted to know if there was an owners club anywhere. Extensive searches found nothing. Any help: contact us ? Peter Donovan of Queensland Australia requested assistance with the restoration. As SVVS do not have this particular model, was suggested Peter contacts Hillman Owners Club. Francois Clouard from FRANCE was given a derelict 5CV Cabriolet and wanted info, provided by Bozi. Also advised him of Alain Roth, in France, who is currently rebuilding one. Hema Ratnayake of Los Angeles USA saw Bozi's 5CV on this website and requested lots of information on numbers, wiring diagram and construction of floor. All provided by Bozi. Jon Beatty of Minnetonka USA required info on where to get bearings for the 5CV dynamo. Bozi recommends Depanoto in Nogent le Rotrou in France for all 5CV bits. Depanoto no web. Enquiry received from the Crawford Auto-Aviation Museum in Cleveland USA www.wrhs.org requesting assistance in valuation of two of their European exhibits; a 1906 Krieger K1 Electric Landaulet (£25K) and an 1899 Gardner Serpolet Steam Carriage (£60K). SVVS do not have facilities to provide this service but assistance kindly provided by Bob Dyke of Steam Car Club GB and Stewart Skilbeck of Bonhams Auto. Enquiry from Michael Martin of ballon village.com in (Ireland) requesting a picture of an 1937 Austin 12 and assistance on identifying and dating two other cars on their very interesting village website. Well worth a visit to what seems to be a lovely peaceful rural community ! Grafix provided by Bozi and information by Desmond Peacock, Bryan Goodman and David Smart. 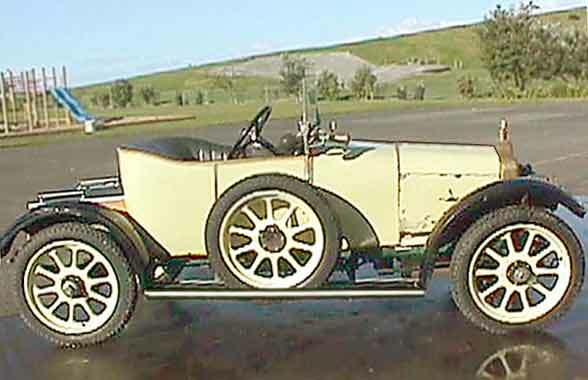 SVVS has a Darracq and four Model T's. Request for assistance from William King of Sussex (UK) whose father has an original single cylinder water cooled 8HP De Dion Bouton languishing in the corner of the garage (wow!). Chassis is slightly different to other similar models seen and the body was taken in period from a local hansom carriage. Through SVVS De Dion owner/contacts we were able to put William in contact with a De Dion expert for help. Interesting photo received from David Penetecost (UK), of a car driven by his grandfather, with the request to provide positive identification and dating. SVVS's Bryan Goodman identified the car as being a chain driven 4 cylinder Panhard & Levassor built between 1905 and 1907. The AA badge on the bonnet is without wings so this dates the badge as pre 1911. 'Washable' seat covers, Oil side lights and Acetylene main beam. Two photos received from Roger Grant (UK) which were taken at Edrom, Berwickshire in 1913 of a car which had belonged to his grandfather Rev. W K Grant. The request was for identification and dating. 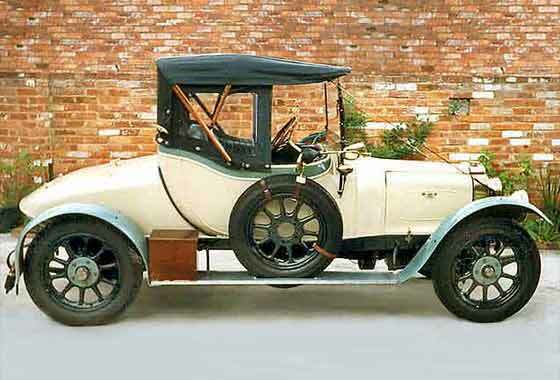 The car shown is a Belsize 10/12 two seater, with a 4 cylinder 1944cc engine, manufactured between 1912 and 1916. 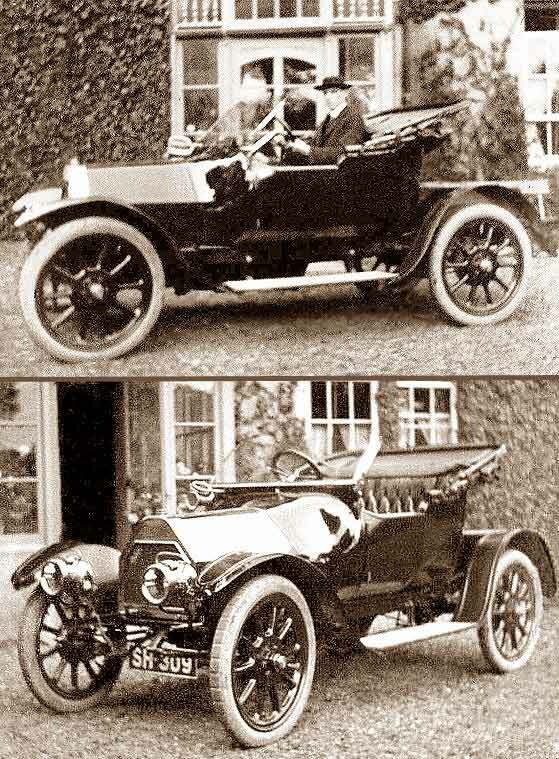 If the picture was taken in 1913, the car was possibly new registered in Berwickshire. Mark Masa in Ohio USA has recently acquired from New Zealand a very interesting vehicle requiring precise identification and dating. It is likely to be Deasey or a Sideley Deasey and it is said to be cca 1912. Mark would welcome all information and assistance in what will be a complex restoration project. SVVS's Simon Pearce and ASOC looking into but all help is welcome. See car & bits: www.linkcycles.com/deasy/index.htm. Interesting Photograph received from Bary Parsons of Victoria AUSTRALIA of a lovely 1914 Mors RX which has been restored by his father Ted. The car was built up from very little and was actually at one stage made into a tractor. It seems that there are about 14 Mors in Oz which must say something for the Oz climate. Not much on Mors on the Net so Barry would wellcome any info and pictures on Mors car history. 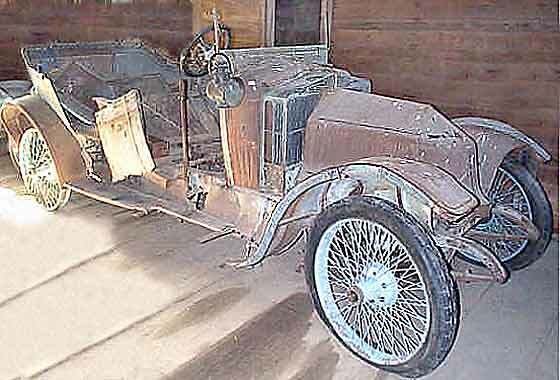 Sarah Laurie from NEW ZEALAND advises this two seat 1914 Calcott was originaly found in a riverbed on the South Island of New Zealand. The engine was in a nearby shed, used to drive a saw bench. All restored in 1972. Later regularly used in local rallies. Requires minor restoration to engine and exterior and has no hood. Being driven on a Daytime Warrant as the gas lights do not run. Contact us if interested. IDENTIFICATION & DATING: 1927 Hanomag 2/10 "Kommisbrot"
Enquiry received from Rick White of Atlanta USA requesting identification of photo of friend's grandfather in Germany in the 1920's. Bozi identified car as a 1927 Hanomag 2/10 "Kommisbrot" (Army Loaf) made in Germany between 1924-28, by company better known for their Steam Locomotives. 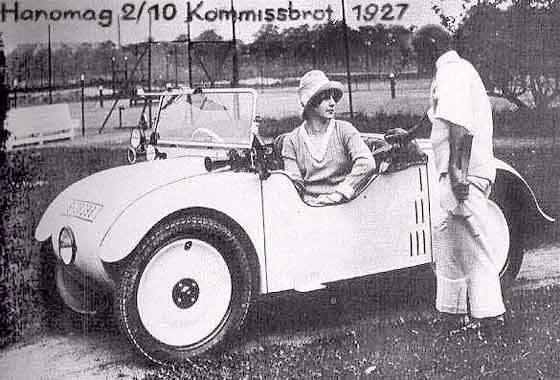 This 2 seat car has disc wheels (so 1927/28) with rear mounted 499cc engine with chain drive to rear axle with no diff. Dated by SVVS Trojan Expert Don Williams. Originally John Graham (UK) grandfather's fish delivery van driven by Albert who lost an arm in First War. Had multiple hand attachments. When driving had a ring on his arm which fitted a post attached to the steering wheel. When cleaning the van this was changed to a hook. In very cold weather van needed parts of fuel system to be heated with a naked flame to start !! Enquiry received from Robert Richardson of AUSTRALIA who is contemplating restoration of a complete car but with rotten runningboards. He requested further information on the Phaeton Body but as the Phaeton is not listed amongst the 14 official bodies for the C6, can only assume the body is of American or Australian origin. From Bozi's records there are no C6s currently registered in the UK. Help ? 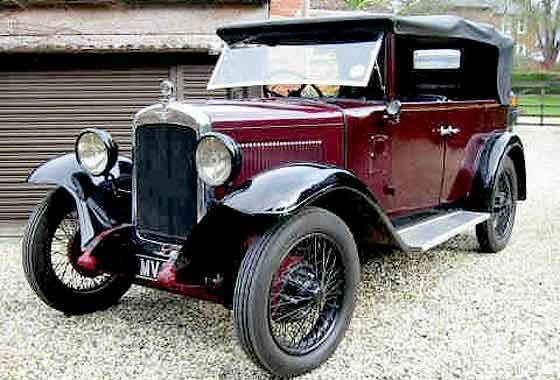 Advised by Chris Rushen in Wiltshire (UK) that his father is thinking of selling their 1932 Austin 16/6 Tourer which has been in the family for over 30 years. Austin 16/6's are quite desirable being at the larger end of the Austin model range. From the photo the car seems in very good condition. Price at this stage is not fixed but likely to be in the region of £12/13K. If interested, contact us and all enquiries will be passed on. Enquiry from Ken Wallis of Sheffield (UK) for correct box. One now located in Dartford from an Austin taxi. Suitable sources for Austin bits can be ads in mags of Vintage Austin Register or Austin 10 Drivers Club, or the Automobile. Also try the Restored Classics small ads which came up with Chris Wilkins in Cwmbran but he only had Light 12 and Cambridge boxes. Also try 'Available Austins' or ' Lancaster Spares'. Request for assistance from Bogdan Coconoiu of RUMANIA, member of the Retromobil Club Romania, who is commencing the restoration of a 1935 Steyr 100 Cabriolet. He is in desperate need of a Bosch Distributor VE 4 ARS 138. If you know of one please contact us. Bogdan is a keen supporter of British cars having a very smart Mini Cooper and also being the President of the Mini Club Romania. Also writes motoring articles. Interesting photo received from Danielle of Great Lakes USA showing her grandfather next to a car pictured in France before the war. The request was to establish the year, make and model. 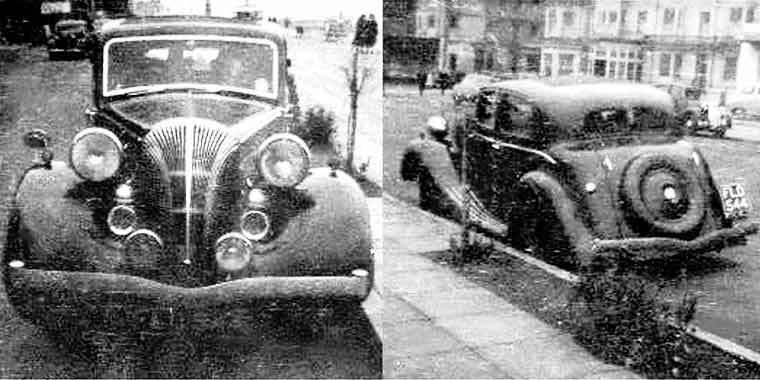 Investigation of the photo suggests that it is a Peugeot of the thirties period, a late Type 301, with a berline style body and higher headlamps, so probably 1934 Peugeot 310 LR NP5 Berline, built between April and August 1934. Email from John Smeardon of Western CANADA (ex Plymouth UK) advising his father had a Ford 7W Tourer and wondered if it was the one SVVS's Tony Russell now has. Tony responded that Ford only made 1009 of these cars and only six have survived world wide! Three are in UK, and one each Australia, Canada & Holland. Tony is the third owner of his, so this not the one ! A known 7W was in the Torquay area in 1937. Interesting contacts with Luis Forteza in URUGUAY who is selling the Sunbeam Talbot pictured in its normal resting place in an underground car park. Luis advises that the vintage car movement in Uruguay is small but it seems to be active there being a good club in Montevideo at http://montevideoclassiccar.com . The car is selling for $13,800 which is a very similar price for a good example in the UK at about £7 - 9,000. Identification of a lovely car spotted in front of a Tyre Fitting Bay in Boulogne, FRANCE, by Bozi Mohacek who managed to snap off four photos before the owner, who was in a bit of a hurry, roared off. Subsequent investigation suggests that this could be one of the 1938 Talbot-Lago Grand Prix cars which won the French Grand Prix and the TT Races in 1939 or perhaps one of the 1939/40 4.5l cars. Investigating. Colin Rolfe emailed from the USA saying that he and his father renovated the Dolomite in 1953 but in '54 moved to the USA without it. Dad, now 95, and Colin, now 63, repainted the car dark maroon and re-chromed. Dad even re-French polished the burled walnut interior. They often speak of the Dolomite and wonder if it survived. SVVS's Jon Quiney advises there is no trace of it on current Register. Help Please ! Request for information from an Author in Scotland researching information for a novel and on which type of lorry would have been used in 1948 to transport Draught Horses from Northern to Southern Ireland. Advice from various sources suggested that the most likely would have been a type OL Bedford Livestock lorry similar to the photo, and that tractors of the day were Ferguson TE20 and Fordson Major. Enquiry from Fernado Gaspar of PORTUGAL as to where he could get spares for his Wyvern LIX. Advised by SVVS's Graham MacKenzie , who has a 1951 Vauxhall Velox LIP, that the main club for these vehicles is the VAUXHALL OWNERS CLUB 1903 - 1957. About 100 LIP and LIX cars are known to survive worldwide, lots of them having been exported to South Africa & Australia. Some spares, mainly mechanical, via the Club. Tim Homes of London (UK) has two classic cars in the family and wanted to know their general values. A Rover 90 P4 of 1955 vintage would be in the band of £1000 to £4000 depending on mileage and condition. The Citroen Maserati of which 13,000 were built is becoming a collectors item and depending on the quantity of rust and if any problems with hydraulics could be in a quite wide band of between £2,500 to £13,000. Kirsty McKay is returning from KENYA and has been offered approx. £2,500 for her part-restored car locally. Maths says she should take it. If she brings it with her as 'personal', no VAT but then she cannot sell it for a year. If commercial import then 17.5% VAT (specialists can reduce this to 5%). Either way shipping about £1500, then Registration and MOT costs. Current UK values for Metropolitan Saloons cca. £3000. Enquiry from Smita in INDIA on identification of an unusual microcar. Identified by Bozi as cca 1936 Rytecraft Scootacar which was manufactured in London N1, 1934-40. Two models, 98cc(15mph) single pedal control, single speed, centrifugal clutch, solid diff; later 250cc also Villiers, three pedals, with electric lights (40mph). Used as midget runabout, children's car & dodgem car ; also commercial 'scootatruck'). Enquiry from Lee Basinski of www.pearlcraft.com.au who are restorers of steering wheels in Melbourne AUSTRALIA requesting information on the appearance of an original 1935 Austin 16 York steering wheel. Mike Knowles was able to provide the appropriate car (currently 'resting') to photograph by Bozi and details were subsequently Emailed. Lee advised the wheel was for apparently the only such car in Australia which was originally bought for the Lord Mayor of Sidney to be driven around in. Enquiry received from Randy Beers of Colorado Springs, USA asking advice on purchasing a London Transport double decker bus already in the USA. As the SVVS is mainly a car club with only limited involvement in buses and commercials it was suggested by one of our members to visit www.busweb.co.uk for potential leads and that the British Bus Preservation Group www.bbpg.org.uk may be a good place to start. 1932 AUSTIN 16/6 : Where to advertise it? Suggested The Automobile Magazine classified. FAIRGROUND ORGAN : Request for assistance in repairs to Ford D lorry on which the organ is. CHARABANC COACH : Request for info where to buy one. The SVVS one is not for sale. Help ? ICE CREAM VAN : Dimitrios Pantelli needs a vintage/replica for an ice cream van. Help ? 1934 TRIUMPH GLORIA : Jean Hunt looking for photos. Jon Quiney of TOC was kind to oblige. BELSIZE BROCHURE : Darren found brochure on a 1913 Belsize in garage in Faversham. JAGUAR XK 140 : J C F-Lopez from SPAIN wants one. Try Jaguar Enthusiasts Club mag. HOUSE & GARDENS : Magazine requested photos of a 1927 Austin 7 open Tourer for article. BBC 2 TELEVISION : Requested a 1970 Lorry for food programme, SVVS Could not help. We recommend that you visit the SVVS sister site :: [ www.restored-classics.com ] :: which is in Gladstone Australia and contains a number of other Historic Vehicle Clubs. Seriously worth a visit. For the latest on the current VW Scene visit Daniels's :: [ www.matey-matey.com ] :: which gives the latest 'low-down' on how to make Golfs and Polos and Corrados look smart and go faster.